Take Action at AHAVA stores! Use our ten-step action guide below to expose the truth about Ahava's dirty secrets! Find downloadable resources for your action in our Muddy Action Toolkit here. Read the FAQ to understand how boycotts can be an effective means of influencing politics for good. The goal of doing a local action is to highlight the illegal occupation of Palestine and continue to build public support in opposition to the blatantly exploitative practices of Ahava. Read our talking points here. 2. Find out where AHAVA is carried in your city. Shortly after our Stolen Beauty campaign began, Ahava removed the listing of stores from their US site, email us at info@stolenbeauty.org for a listing of stores in your area. Please let us know what (if any) organization you are working with in your action, what city you live in, and provide your telephone number. 3. Ask the store to stop carrying AHAVA. First, go to the store and ask to speak with the manager; arrange a meeting if the manager is not available. Tailor our manager letter for the specific store and person you meet with, and print. Plus, deliver our response letter to a letter sent to store managers by Ahava's CEO. At your meeting, give the manager the letter and explain your concerns about carrying this product. If you can't get a meeting with the manager, serve the letter to a clerk or mail it. Negotiating for change is an important step of this action. If the store honors your request, congratulations! In discontinuing sales of this product, this store is sending AHAVA a message that their business is being threatened if they continue status quo. You will want to thank the store and possibly draw public attention to this brave stand. If the store refuses to honor your request within the time given, or doesn't respond, it's time for direct action. Read on. 4. Get a Team together. An ideal team has three or more participants. One to take action, another to distract security or talk to management, and a third person to document with photographs or video. Of course, don't be limited by the three people minimum! Watch this great youtube from a group of dozens of activists protesting AHAVA in a cosmetics store in France. You may also want to invite ally peace groups to do an outside vigil while the team inside creates a ruckus. There may be a CODEPINK group in your area that wants to help, email locals[at]codepinkalert.org to find out or see our online listing. Check out the store, shelves, or section of the store carrying AHAVA products. Scout for security, employees, access to location, and amount of foot traffic. Who will be responsible for what part of the action? What does the action look like? Who will carry in which supplies? Who will negotiate with security if they show up? Who will talk to media? Who will talk to employees, security, or managers? Check out some of our previous actions for inspiration: Las Vegas, New York, and Tel Aviv. For help planning your action contact us at info@stolenbeauty.org and Nancy at nancy[at]stolenbeauty.org. You can download our Action Checklist for ease in action planning. 7. Create a Press Release and invite the media. Download our sample press release here. You can visit CODEPINK's Media Resources page for more help. Leafletting - handing out information to consumers, employees, etc. Print out our downloadable petition, 1/4 page flyers, songsheets, and other resources. Find resources in our Muddy Action Toolkit. Acquire mud, bathrobes, towels (as desired). Go over talking points again. Have camera battery charged and camera tested ahead of time. If you are using mud as a visual you can put some on your hands (Hey, Ahava! You've got blood/mud on your hands!) or write "No AHAVA" or another message with the mud on your body. Allow time for drying. Mental preparation: Center yourself in the goal of the action. Most likely, there will be some people who vehemently disagree with this action, they may even say you are anti-Semitic or evil. Be prepared to face this kind of opposition peacefully and calmly, and stay focused on your goals. You've Scouted. You've Prepared. Now you are ready to go! When you are done, share it! We want to know how it went. Report your action to the Local Spotlight on our website. Send a follow-up thank you email to everyone participated, and email your community with a report back about the action and how people can continue to be involved. Ask people to call the local stores and request they remove AHAVA products from their shelves. Send any photos, videos, news links and report back text to locals[at]codepinkalert.org to add to our website. Share your action with your friends on Facebook or Twitter. Include links to your photos or StolenBeauty.org. Follow up or contact local media. Keep up the pressure! A one-time action is great, and repeated actions are even better. Consider organizing a weekly vigil outside the store to hand out flyers; create a letter for customers going in to shop at the store to give over to the employees and keep track of how many you hand out; invite people in your community to call the store and ask them to stop carrying AHAVA (this is a simple action to do from home). Write letters to the editor of your local newspaper. Stay visible and focused on raising awareness about the illegality of Ahava products. Follow up with the corporate or head office of the store or chain about removing the products. You can post the above web buttons on your blog/website. Or make your own. Make sure to include codepinkalert.org or stolenbeauty.org on all your posters! 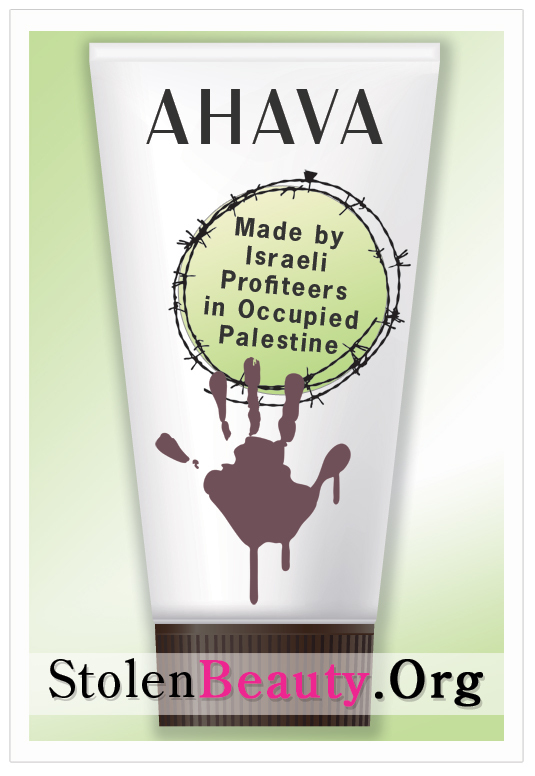 Your store carries products made by Ahava Dead Sea Laboraties, an Israeli company that is currently the target of an international boycott because it profits from the illegal occupation of the Palestinian West Bank. This letter is a request from CODEPINK Women for Peace (www.codepinkalert.org) that you stop stocking these products. Ahava Dead Sea Laboratories (www.ahava.co.il) is a privately held Israeli cosmetics company that manufactures products using minerals and mud from the Dead Sea. The Hebrew word “Ahava” means love, but there is nothing loving about what the company is doing in the Occupied Palestinian territory of the West Bank. The company's main factory and its visitors' center are located in the Israeli settlement of Mitzpe Shalem in the Occupied West Bank. Ahava products are labeled as of 'Israeli origin,' but according to international law, including the relevant UN Security Council Resolutions, the West Bank cannot be considered to be part of the State of Israel. Not only does Ahava profit from the occupation by locating its main plant and store in an illegal Israeli settlement, it also uses in its products mud from the Dead Sea, excavated in an occupied area, and thus it exploits occupied natural resources for profit. The fourth Geneva Convention explicitly forbids an occupying power from removing the captured natural resources for its own use, and we see this as another charge for which this company should be held accountable. In July 2005 a broad range of Palestinian Civil Society organizations issued a call for Boycott, Divestment and Sanctions Against Israel as part of a non-violent campaign to end the Israeli occupation of the West Bank, Gaza and East Jerusalem. Individual American consumers are showing their opposition to Israel's occupation by participating in a consumer boycott against Ahava products. We hope that you will show your support for international law and human rights by choosing to no longer stock Ahava Dead Sea Laboratories products in your store. Thank you so much for your attention and consideration.